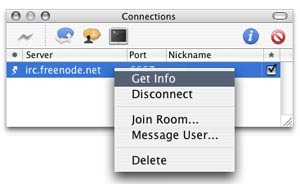 IRC (Instant Relay Chat) is a low-bandwidth chat protocol, similar to instant messenger, but allows for multiple users to be communicating at the same time. To use IRC, you must first have a client. 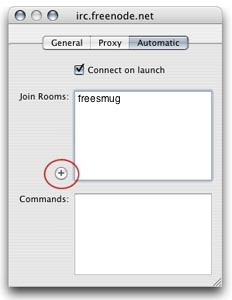 You then use this client to connect to IRC servers. Once connected to a server, you then join a channel to begin "chatting." 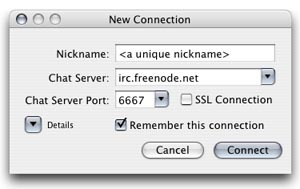 This article provides step-by-step details on configuring an IRC client, joining a channel, and other tips and tricks. 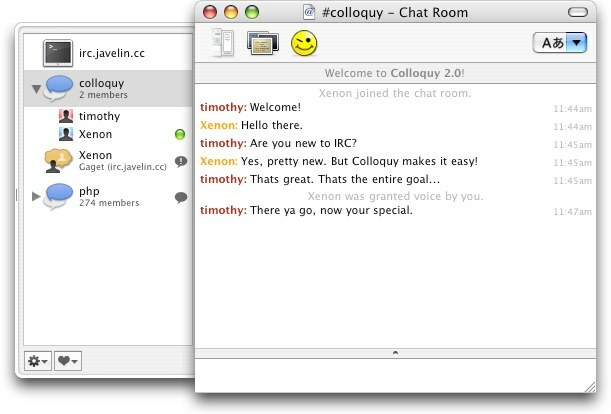 After launching Colloquy, you will first need to establish a connection with an IRC server. This is done via "New Connection…"(cmd+N) in the File menu. A dialogue will appear asking you for a Nickname and the Chat Server's address. You will have to choose a unique nickname. If the nick that you select is already in use, you will get an error when attempting to connect. If it is unique, you willbe able to register it once you have connected. Now click "connect." You will then be connected to the server and a chat window will appear. A drawer can be opened (shift+cmd+D) to see the other users in the channel and tabs enabled (in preferences) for multiple channels. Colloquy is completly customizable allowing you to change the fonts, colors, and even skin used for the chat window. 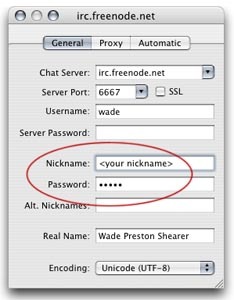 To register your nickname, type "/msg NickServ REGISTER <password>", where "<password>" is a unique password that you select. Make sure that you write this down as it is extrememly difficult to get it reset if you should forget it. See this site for more information, tutorials, and frequently asked questions.